A year after it open sourced its PaddlePaddle deep learning suite, Baidu has dropped another piece of AI tech into the public domain – a project to put AI on smartphones. Mobile Deep Learning (MDL) landed at GitHub under the MIT license a day ago, along with the exhortation “Be all eagerness to see it”. MDL is a convolution-based neural network designed to fit on a mobile device. Baidu said it is suitable for applications such as recognising objects in an image using a smartphone's camera. The neural network's calculations are offloaded to a phone's GPU, the company says at its repo, with high speed and low complexity. While it runs on either iOS or Android, the project's documentation leans more towards Apple than Google, with GPU support still an Android to-do, along with TensorFlow model support. Baidu says the code fits in around 4 MB with no third-party library dependencies (beyond the neural networking models). The developers recommend the company's PaddlePaddle model for use with MDL, but it can also use Caffe. 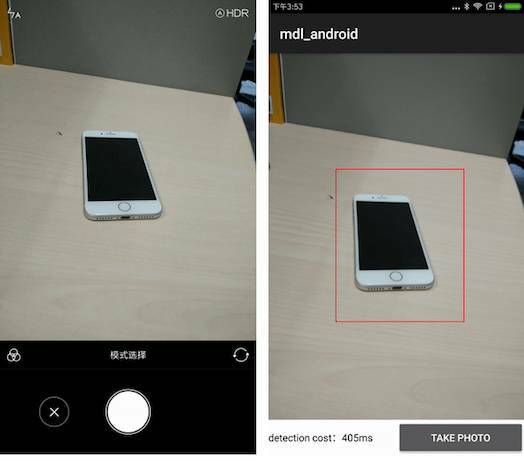 The screen shots below show MDL can recognise a smartphone in less than half a second. Another MDL demo identified the pattern on a china teacup, and used that as in a search to find matching products for sale.